Edmunds Review - Can They Deliver the Deals? Find out what others paid for similar vehicles in your area. Get upfront prices on the vehicle and added options you want. Price quotes are free and no obligation. Receive up to 5 price quotes from Edmunds trusted dealers. Dealers Compete - you win! If you're in the market for a new car, Edmunds is a great resource. An entire section of the site is devoted to new vehicles, and you can zero in on the right one and learn more about it in a number of different ways. Whether you have a specific model in mind, or if you are still trying to find the vehicle that's right for you, the new car section on Edmunds is sure to help. Learn more about how it works below. Pinpointing a worthwhile new car is easy on Edmunds. You can begin by selecting a body type. Options include SUV, sedan, hatchback and crossover. After choosing the body type that you like, you will be able to narrow things down according to price and available features. Eventually, your search should lead you to a likely candidate. Another way to find a new car on Edmunds.com is by clicking around through the car finder feature. You can click check boxes for things like price range, make, type and features. With every click, a new list of options appears. You can also see how many vehicles fall into a particular category. For example, you may find that there are 35 vehicles that have all-wheel drive that fall within your price range. One of the best things about the new car section on Edmunds is that it allows you to focus on finding a great vehicle first. From there, zeroing in on an exceptional deal is a snap. 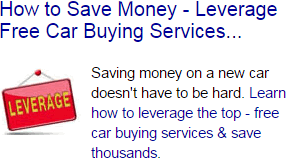 When you arrive on the page for a specific make and model, you will see a link that says "Get a Free Price Quote." You will already be armed with Edmunds' True Market Value, and you can use that as a starting point. The actual quote process is intuitive. You need to provide your contact information. Based on your location, a list of dealers who have the car that you want will also appear. You can select all of the dealers to get several quotes, or you can just choose a few of them. Compared with driving from one dealership to the next, this is fast and convenient. You can take care of a lot of research in a short period of time by visiting the new cars section on Edmunds.com. Before you know it, you'll have several quotes and will be able to make a more informed decision.